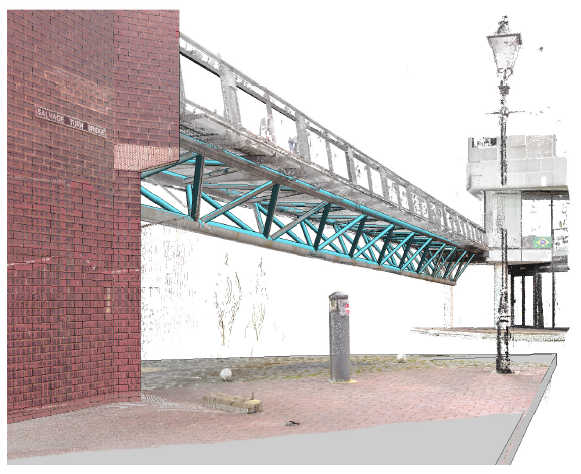 Our surveyor Louis Weston produced a 3D perspective view of the bridge using our Faro 3D laser point-cloud scanner, and then modelled it in Revit. The bridge known as Love Lock Bridge is next to the Cube and The Mailbox developments and crosses the Worcester & Birmingham Canal. Structural steel, abutting pier supports (masonry), stairs and topography of the bridge were modelled. The scanner gave us highly accurate measurements (in the form of a point cloud) which we coupled with full HDR 360 imagery of the entire structure in less than half a day, whilst being a safe distance from the canal itself. The scan enabled us to verify the design solution by checking how the construction of the existing structure matched up with design drawings.